There are so many different types of accordion mini books One of the easiest and most popular mini albums that you can make is an accordion or concertina album. 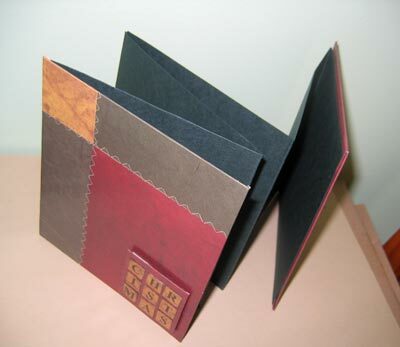 All you need for a basic album is simply cardstock, the pages are created by folding lengths of cardstock concertina style. If more pages are needed they can be appended to the last page. For a longer lasting album I would recommend adding a couple of sturdy chipboard covers sealed with a product like mod podge for extra durability. Have fun with this selection of accordion scrapbooks. We hope you get a chance to make them all. If you would like to submit your 'how to' tutorial or accordion mini album please feel welcomed to do so via the submit album page. How to make a 4x4 accordion album made in no time at all from only 1 sheet of 12x12 cardstock. Great idea for gifts around Christmas time. They also make good baby announcement cards...if you get the time. A cute accordion tag book made with 2 sheets of cardstock. 1 sheet for the album and the other for four tags or coupons. Just another method for making a concertina album. The cardstock pages are thicker when you use this method.